Announcement HAPPY SPRING!!! 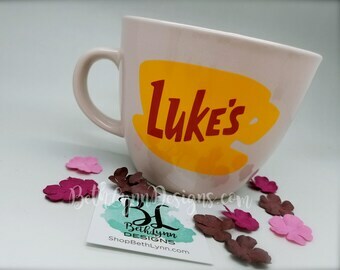 Use code "SPRINGFLING" for 10% off mugs! LIMITED TIME ONLY! 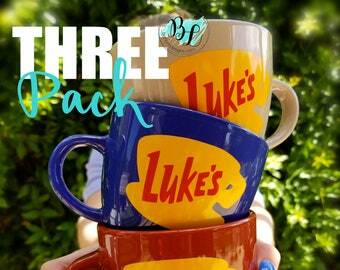 Home of THE ORIGINAL Luke's Diner inspired BIG MUG! 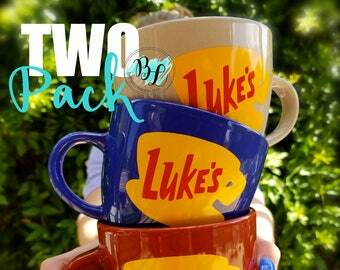 HAVE A LARGE MUG ORDER OR NEEDING LUKE'S MUGS FOR A SPECIAL EVENT? Message us so we can set up a special custom listing just for YOU with combined shipping for large orders! 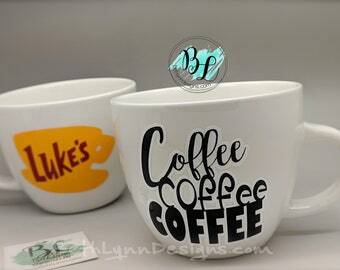 Here at BethLynn Designs, we specialize in customized drinkware, trendy apparel, personalized totes & cosmetic bags, ArtisticSoles Hand Painted Footwear, fun nail art decals & other 'cool stuff' embellished with vinyl designs and artwork created and professionally applied right here in our studio in Texas! 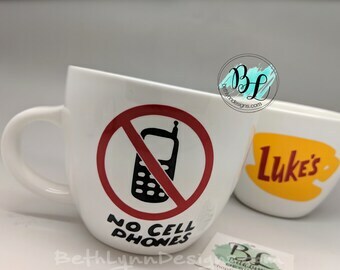 We create items to inspire you, commemorate a special moment or event and just fun items to make you smile and enjoy this crazy life... with a little sarcasm thrown in for good measure! Ha! :-) We hope a bit of BethLynn Designs can journey with you through this crazy, beautiful and oh-so-worth-it life! Thanks for visiting us! Message us with any customization requests or questions! ***PLEASE READ ALL DETAILS IN EACH PRODUCT LISTING, OUR SHOP POLICIES AND REVIEW OUR SHOP FAQ'S BEFORE PURCHASING AN ITEM. *** We reserve the right to discontinue certain design options and products offered in our shop and we also reserve the right to add certain design options and products to our shop without notice. We love supporting small businesses and we thank you, in advance, for supporting ours! ©2010-2018 BethLynnDesigns - BethLynnDesigns.com - ShopBethLynn.com - All designs, photos, and descriptions are copyright of Artistic Soles and/or BethLynn Designs and photos may not be used without prior written permission. Thank you! HAPPY SPRING!!! Use code "SPRINGFLING" for 10% off mugs! LIMITED TIME ONLY! I bought these for my daughter & they are BEAUTIFUL! 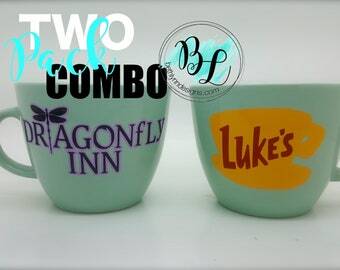 ( wish s few ounces bigger) but beautiful decal & colors! We got the Mint & Dune ( which is sorta gray/taupe) REALLY wanted the pale pink or coral, but hoping they will return please!! We have not used/washed yet, so not sure if longevity of decal, but looks like in pretty securely! Hope to see more pastel colors so can get 2 more! I love this mint mug!! The seller was awesome, I had a shipping error on my part and she re sent it with no issues. COPPER BOOM! is back! Now, on our beautiful Ballet Pink mug and now with gorgeous, shimmery ROSE GOLD! NEW MUG COLOR FOR FALL! Ballet Pink! Check it out! Perfect for coffee (or tea) and snuggling this chilly fall! Grab yours! Did you know we offer custom, hand painted TOMS, Converse, Vans, etc.? We do! So happy to be bringing back our ArtisticSoles! Kicking it off with our signature sunflowers! More coming! Message us to begin your custom design today! Customized Vinyl Designs & Handpainted footwear created in our studio and made just for YOU! We began our Etsy journey in 2010 with hand painted TOMS, Vans, Converse, etc. Our little shop grew & expanded and added products outside of customized, hand painted shoes. Our design ideas continued to flow but our shop name didn't quite fit this expansion and we decided it was time to separate our products into two shops to continue to expand our product line and to give our customers a better opportunity to view all of our items here on Etsy. BethLynn Designs was born! Our growth in this new shop has been phenomenal! Beyond our expectations! 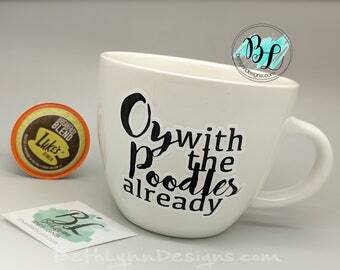 BethLynn Designs quickly became our top focus here on Etsy! Our new product additions have been so much fun to design, customize and produce and we are continually adding new products ... even bringing back a few of our most favorite and most popular custom shoe designs from Artistic Soles and adding them into the BethLynn Designs lineup for what has now become a complete family of products under a business name inspired by my amazing daughters! We are SO excited and we're all feeling unbelievably lucky! We are beyond grateful for your support! We hope you'll stick around and watch us continue to grow! Message us for customization requests or questions! We're happy to help and we can't wait to meet you! PLEASE BE SURE TO READ ALL SHOP POLICIES AND SHOP FAQ's BEFORE PLACING AN ORDER! Spot cleaning only is recommended, but bag can be machine washed in cold water, if necessary (turn inside out). Some shrinking may occur. Do not use bleach. Line dry. Low heat iron on canvas only, NOT on design. Hand wash only. Not recommended for microwave use. Non abraisive cleansers only. No bleach. Wash in cold water on gentle cycle (turn garment inside out). Hang to dry. Some shrinking may occur. Low heat iron can be used on fabric only, NOT on design. Spot cleaning only is recommended for all vinyl and hand painted shoe designs. Air dry only. Hand painted designs are sealed for water resistance and longevity, but are not waterproof. Wear with care. Sizing details are explained in the individual listings. Please make sure to review sizing measurements before ordering. If you have sizing questions, please inquire BEFORE placing an order. We cannot accept returns due to customer ordering an inaccurate size. If you are unsure about shoe size, it can be helpful to try on the brand name shoe style at a local retailer in your area FIRST in order to determine your correct shoe size before placing your order. 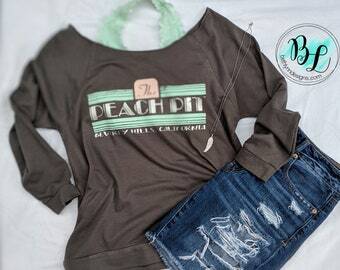 Most items in our shop are customized by color, name, sizing, etc. We cannot accept cancellations or returns on custom and/or personalized orders. Please make sure to review sizing details, color details, and shipping times before placing an order. If you have questions, please message us BEFORE placing an order. While exchanges may be VERY limited, our top priority is customer satisfaction. If you have a problem with your order, please contact us! We will make every effort to resolve any issues promptly. Each item is wrapped in protective wrapping (such as bubble wrap) as necessary for shipping protection, then tissue paper wrapped and adorned with a bow for supreme cuteness and stylish gift-giving! Care instructions are included with all items. Gift notes on a small card can be included with any order. Just let us know that your order is a gift, then notate your special message in the "Notes to Seller" section at check out and a card will be included with your order (no extra charge). Invoice information is never included in shipments for worry-free gift giving. Shipping time by the carrier is not in our control. If shipping delays occur due to the carrier, we cannot be held responsible. Each item in our shop is made and/or assembled by hand. Some slight variations from the photos may occur, but should only be minimal and should not be seen as defective. Some computer monitors may show slight color distortions. This is not to be seen as defective. As always, if you have any product questions, please message us BEFORE placing your order. Because of the customization and personalization of most every item in our shop, returns are not accepted and exchanges are VERY limited on items arrived as ordered. However, our top priority is customer satisfaction. If you have a problem with your order, please contact us! We will make every effort to resolve any issues promptly. Each non-applied decal, including tiny nail decals, purchased from our shop will come with a clear transfer sheet attached for easy application and an instruction sheet for application instructions. If you have any questions about the application process, please message us before placing your order. While we don't anticipate damages in manufacturing or damages in shipping, sometimes issues can occur. If your order arrives with manufacturing or shipping damages, please contact us immediately (not longer than 3 days after arrival) with evidence of the damage (via photo) and we will promptly supply exchange instructions. Some of our items are fragile - BE SURE to check for any shipping damages UPON ARRIVAL even if you are giving the item/s as a gift at a later date. While we are NOT responsible for lost items or shipping damages, we will assist in any way we can to replace your damaged item, file a damaged item claim, or file a lost item claim with the shipping carrier. A photo of any damage will be required. Any order that arrives as ordered is NOT eligible for return. We cannot cancel any order that has been started. Shipping costs for any exchange are the buyer's responsibility. If your product arrives damaged or defective, please contact us within 3 Days of delivery. Please be certain to enter the correct shipping address for your order. We cannot be held responsible for incorrect addresses entered in Etsy. Order shipping address changes after an order is placed are not guaranteed. Reshipment costs of returned mail items due to an incorrect address provided by the buyer are the buyer's responsibility to cover. If you encounter a Sold Out item, please be aware that our available stock updates each night at approximately midnight (CST), if available. If an item is sold out, we typically will have restocked the item the following day so be sure to check back with us. When will my order ship and how long will it take to get here? You will find a "Ship By" date on your invoice. Your item/s will ship on or before this date unless we have previously discussed another shipping date. We are not responsible for any shipping delays by USPS or lost items by USPS as we do not have any control over shipping carrier procedures once our packages are in their hands. However, we will assist in any way we can with any shipping issues. USPS shipping time frames are estimations only. USPS Express is the only shipping service we offer with any specific "guaranteed" delivery date (additional charges apply) abd this service is only offered on a limited basis. How can I add multiple colors of the same item on one order? If you are ordering multiple items in different colors, Etsy requres each item to be added to your cart separately. Simply click on the first color choice and add it to your cart. Go back to the listing and click on your second color choice and add it to the cart. Etc. Etsy automatically combines shipping of multiple items to one address. My "Ship By" date on my invoice is a US mail holiday. When will my order ship? If the "Ship By" date listed on your invoice is a US Postal Service holiday, your order will ship on the next available regular shipping day. When will orders with multiple items that have different production time lengths ship? Orders with multiple items on that order will ship together when ALL items have completed production time and ALL items on the order are ready to ship. Your invoice will state the final "Ship By" Date. Coupons, sales promotions and discount codes may be subject to limited timeframes, expiration dates and discretionary terms. We reserve the right to discontinue any coupons, sales promotions or discount codes without notification. Coupons, sales promotions or discount codes are not eligible to be combined. If you have any inquiries regarding current coupons, sales promotions or discount codes, please message us! We are happy to help! Etsy Marketplace will automatically combine shipping for multiple items from one shop that are shipping to the same delivery address. However, while Etsy's calculated shipping system is not always completely accurate depending on shipping location. We have mug packs available to help alleviate this issue. If you are concerned about shipping costs on your multiple-item order, message us and we can set up a special custom listing for your large order with manually calculated shipping. More questions? Let us know! Shipping on the stoneware mugs seems expensive - is there any less expensive way to ship? We utilize USPS shipping as our shipping source here at BethLynn Designs. All domestic USPS shipments over 15.99 ounces must be shipped via Priority Mail with USPS. We cannot deviate from this standard requirement set by USPS. Our mugs do not fall within the domestic First Class shipping weight requirements, therefore they must be shipped by USPS Priority Mail. We do offer First Class shipping on listing items that fall within the weight range requirements. Please also know that the shipping costs vary based on the distance from our location (Dallas, TX) to each shipping location. These costs are standard and we do not charge a packaging or handling fee. International buyers are responsible for any customs or import taxes. We only declare factual and true costs on goods sold. Fraudulently declaring lesser costs for the purpose of lowering import taxes is against the law. We are not responsible for a buyer's inability to retrieve international packages when notice for retrieval has been given by the international carrier. Reshipment costs of unretrieved, returned packages is the responsibly of the buyer. We are not responsible for any customs and international shipping delays. Tracking information for international packages is not guaranteed. Please plan for possible lengthy mailing times and unpredictable arrival dates for international shipments especially during peak holiday times. My combined shipping costs on my large order seems high. Can you help? Shipping costs are automatically calculated by Etsy for our listings. Keep in mind that shipping costs vary depending on the distance between our location and the shipping address. While Etsy's calculated shipping works great, on larger orders of 4+ mugs it is not always quite as accurate when calculating combined shipping costs. If you are concerned about shipping costs on your muliple-item order, message us and we can set up a special custom listing for your large order with manually calculated shipping. If we incur a shipping overage on your order, we will issue a refund of that overage after shipment.